After almost a month of immobility, Summer is now walking on all fours and that sparkle has returned to her eyes! We hope that with this physical therapy she shall someday cast her chair aside. Summer came to us very young with two other female lambs in 2007. They had all been seized from a horrible neglect case in which many other lambs died before their rescue. It was the middle of winter and we did not yet have our Animal Rehabilitation Center built, and so they lived in Jenny and Doug’s house! They slept in a pen set up in the kitchen but were allowed to frolic from room to room. As charming as that sounds, very few cleaning products are capable of cleaning lamb urine out of living room rugs! The trio thrived and quickly became well-known as absurdly friendly to visitors and staff alike, helping to dispel the myth that sheep are dumb or overly timid. In April 2011 Summer’s back legs became wobbly and the problem progressed over the next few days. Blood tests were inconclusive but indicated that something was wrong, so we took her to the experts at Cornell Veterinary Hospital. They determined that she had acquired a parasite known as Meningeal worm. Carried by wild deer, when a sheep becomes infested with Meningeal worm the parasite moves into the brain and/or spinal cord and causes neurological problems that can be fatal. She was given treatment but the damage to the nerves in her spinal cord could potentially be permanent. Summer, unable to frolic with the rest of her flock, seemed to be depressed and her condition worsened to where she wasn’t able to stand or walk around on her own. That’s when we contacted Eddie’s Wheels in Massachusetts. 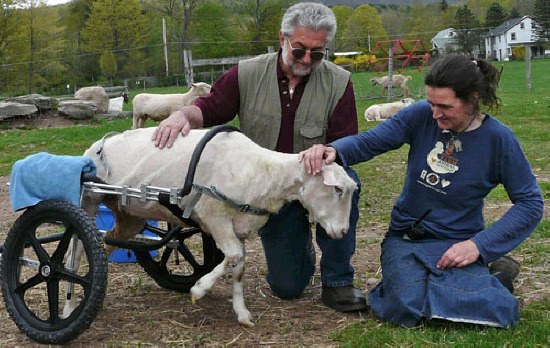 Well-known for their work helping dogs and cats with mobility issues, the mechanical genius Eddie Grinnell has also helped farm animals. Summer is now able to walk with assistance from her special wheelchair fitted perfectly to her needs. After almost a month of immobility, Summer is now walking on all fours and that sparkle has returned to her eyes! We hope that with this physical therapy she shall someday cast her chair aside, but for now it’s a huge help. It’s your support that allows us to do such things for rescued farm animals, and so we and the critters thank you! And now is a great time to give with our current Matching Fund Drive. Please help us continue to help more animals like Summer.